NGC 6240: Black Holes Go "Mano A Mano"
This image of NGC 6240 contains new X-ray data from Chandra (shown in red, orange, and yellow) that has been combined with an optical image from the Hubble Space Telescope originally released in 2008. In 2002, the discovery of two merging black holes was announced based on Chandra data in this galaxy. 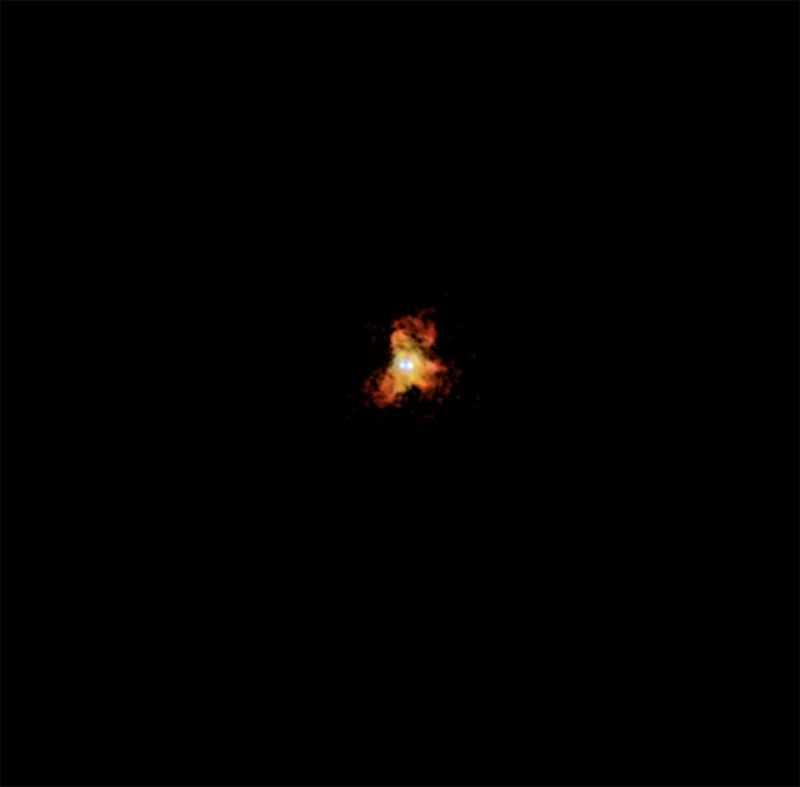 The two black holes are a mere 3,000 light years apart and are seen as the bright point-like sources in the middle of the image. Scientists think these black holes are in such close proximity because they are in the midst of spiraling toward each other — a process that began about 30 million years ago. It is estimated that the two black holes will eventually drift together and merge into a larger black hole some tens or hundreds of millions of years from now. Finding and studying merging black holes has become a very active field of research in astrophysics. Since 2002, there has been intense interest in follow-up observations of NGC 6240 by Chandra and other telescopes, as well as a search for similar systems. Understanding what happens when these exotic objects interact with one another remains an intriguing question for scientists. The formation of multiple systems of supermassive black holes should be common in the Universe, since many galaxies undergo collisions and mergers with other galaxies, most of which contain supermassive black holes. It is thought that pairs of massive black holes can explain some of the unusual behavior seen by rapidly growing supermassive black holes, such as the distortion and bending seen in the powerful jets they produce. Also, pairs of massive black holes in the process of merging are expected to be the most powerful sources of gravitational waves in the Universe. Thanks for your interesting comment, but I disagree with your contention that "practically all of physics disputes that they can exist in physical reality". I think only a small fraction of physicists and astronomers dispute that they really exist. It's important that such skeptics exist, just as as it's important that skeptics about the existence of dark matter and dark energy exist, but they're outnumbered by a lot of smart people who are also very skeptical in their own right, but believe in these exotic objects. I too appreciate the opportunity to view such images of the wonders out there. However, although a mathematical existence of massive and super massive Black Holes is a logical postulation, practically all of physics disputes that they can exist in physical reality, despite the observed phenomena that demands an explanation. To ascertain the reasoning backing that statement it is available at the email address provided. Stellar destruction doesn't seem very loving, does it? But, I don't think all of the stars would be doomed, depending on what their orbits are like. For example, some might end up being ejected from the center of the galaxy in a type of gravitational slingshot. So, it would seem that stars located in plane of their mutual orbit within the volume of space between them, sphere of diameter 3,000 light years, are doomed to be absorbed by one of these black holes as they spiral to together in the course of the next hundred million years or so. Would that reveal the loving hand of the creator at work? I am fascinated by the symmetry of the tri-lobed x-ray emissions around the two point sources. Since these emissions come from accretion into the black holes is there any theory as to why it has formed this shape? I have read many science books dealing with the subject of black holes. My question is what is the present day theory of the purpose of black holes in the center of galaxies? In some of these books they were called the engines of the galaxies but this does not explain very much to me. This is ecstatic and very educational, thank you for giving us this update. Ever since Hubble and Chandra images were avail for viewing, I am reminded of the awesome and Majestic hand of God and how thankful I am to be in this universe, and to Galileo, to have invented a seeing instrument, that is no more 3 to 4 ft long, to help humanity see so far. Every time I look at any of these cosmic views, I am in Love with. The Wheel in the Sky and all the things in the Heavens it only gets sweeter and sweeter, the deeper I go. Yes, you can quote a post in your blog. The image is so attractive that I can,t stop looking at. The Universe is so marvelous that I don't know how to describe and mention. We are so lucky that we are born and live in this planet earth in the big big family of this full of astonishment Universe. We give it 8 stars. It is beyond imagination every picture an astonishing sample of the immensity of God's creation and man's accomplishment. Thanks for this investigations and research. 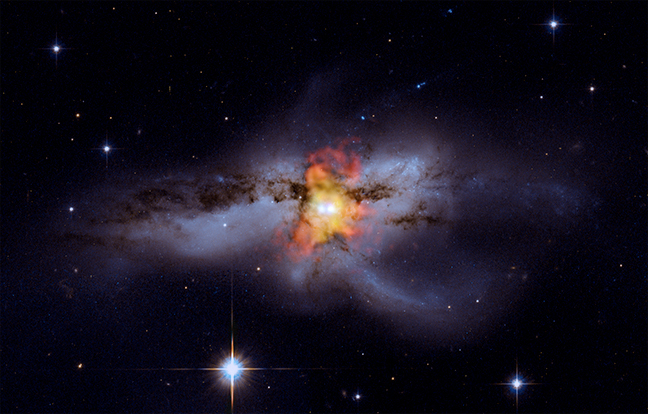 The dance of these two supermassive black holes is so beautiful. I can not stop looking at this Image. And I can see in my one mind the power of gravity and the gravitational waves coming from these two black holes. These new images are proving invaluable in testing theories. WOW, give it 5 stars.